I was introduced to Young Living oils a few months ago. They have an all natural cleaning product called Thieves Cleaner. (That is a link to my personal Young Living site where you can find Thieves cleaner to purchase.) It is a multi-purpose cleaner for everything from countertops to hands to floors to windows to laundry. It does it all. Of course, my first thought upon buying a bottle was, “I’m going to put this in my steam cleaner and see what it’ll do for my carpets.” I’ll go ahead and give you my pros and cons up front and then go step by step though carpet cleaning with Thieves Cleaner. First, this cleaner is all natural. No chemicals. No harsh fumes. No RINSING necessary. No worries about baby crawling around on it. Second, because of that no rinsing bit, this is much faster than my traditional OxiClean route. 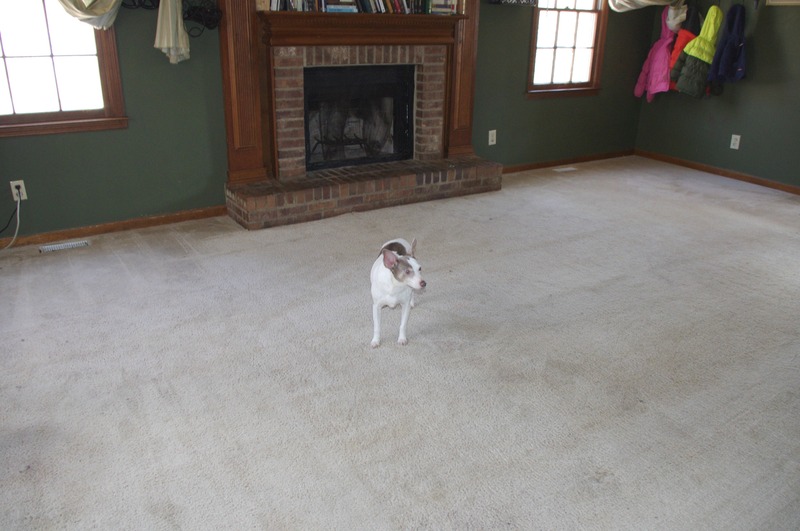 Third, your carpets will feel softer when they dry using Thieves Cleaner than using OxiClean. Fifth, it kills germs and viruses and fungus. 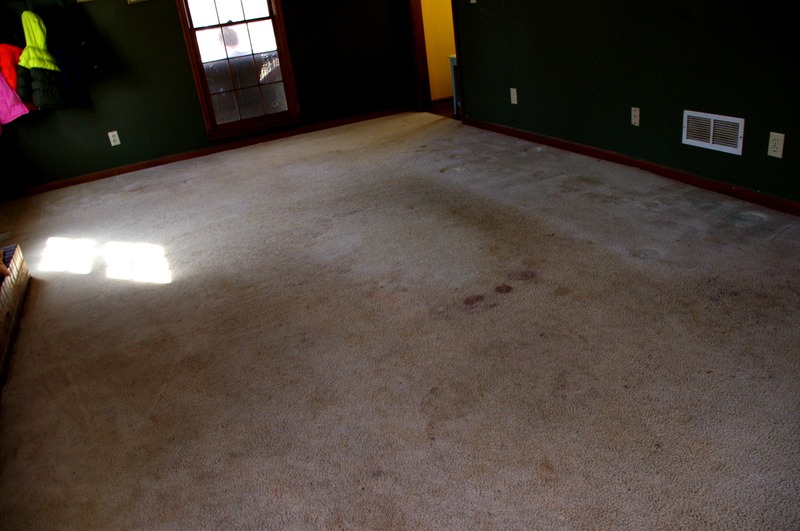 Now, this is not going to get your carpet as super duper white as OxiClean, Dawn, and TTO. 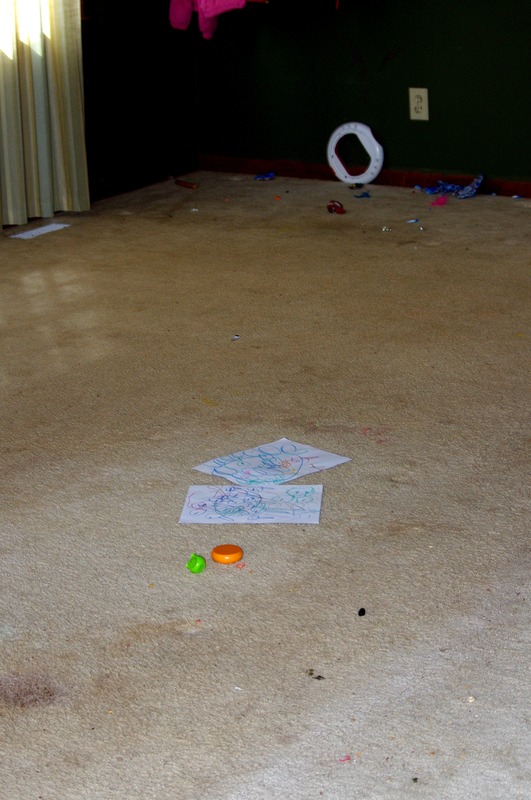 If you’ve got thick gummy gunk in the carpet, you may want to go the OxiClean route. 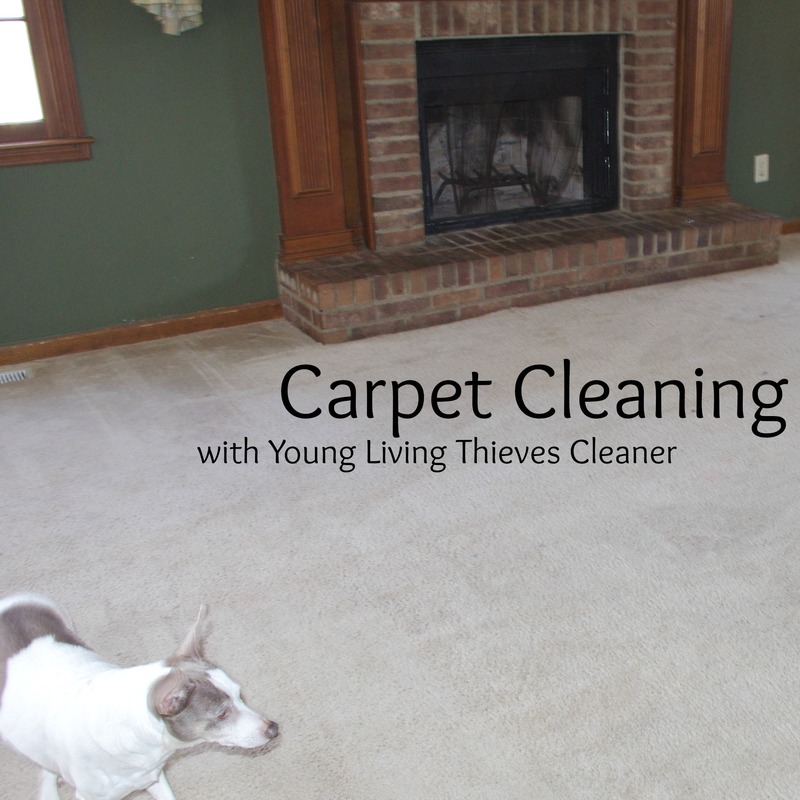 I personally now view the OxiClean routine as my heavy duty carpet cleaning and this Young Living Thieves oil as my routine, most-of-the-time carpet cleaning. Step One: Clear out all the furniture. Yes, you need to. And this picture is why. I found about a dozen empty fruit snacks wrappers from some sneaky little person. I also found random toys, papers, rubber bands, buttons, change, a glow stick, a straw, several crayon nubs… you get the picture. If you don’t move your furniture, all that stays hidden. Also, if you have pets- they tend to mark their territory on chair legs, table legs, side of the couch, etc. So, if you don’t move the furniture, you won’t get to all of that. Plus it is just easier to clean a big empty room than clean around stuff. Vacuum. Note my before picture. You’ll see chocolate milk stains, turmeric stains, jello stains, slime stains, muddy dog feet stains, dog pee stains (it wasn’t set in, fresh, yay- see my sarcastic font? ), something red, and something blue. 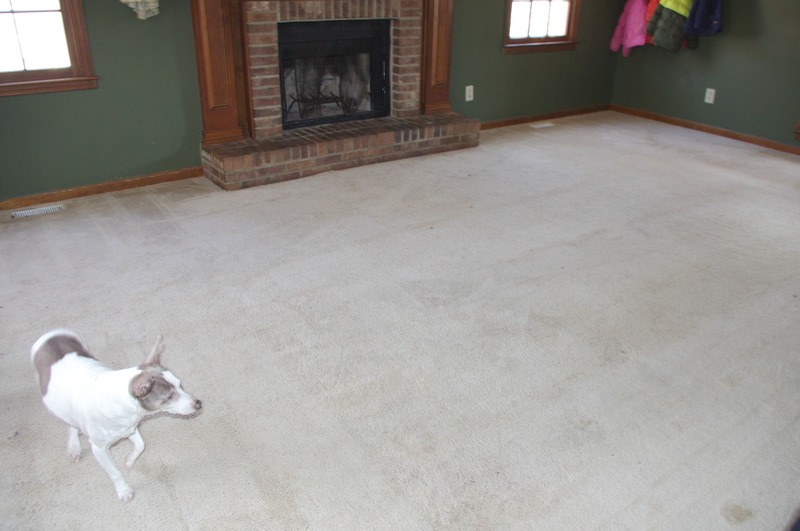 And yes, I cleaned this carpet in full less than 2 months ago. Now, add one capful of Thieves Cleaner into each fill of clean water in your steam cleaner. It does foam a little, so add the water (preferably hot) and then the cleaner. Steam clean the entire room. I used 4 fills of my steam cleaner (4 capfuls). Then I used my upholstery attachment and spot cleaned the stains that didn’t want to let go. (This is different from my OxiClean routine where I scrub the spots with Dawn.) Since this is an all natural cleaner, it leaves no residue, so I have no reason to rinse the carpet. And I’m done. Like that. That fast. Chocolate milk stain- gone. Senile dog pee- gone. Slime and jello- gone. Tumeric- still there. (This turmeric has been in my carpet for over a year now. Even a professional carpet cleaner couldn’t get it out. Moral of the story- keep turmeric laden foods off your carpeted areas.) Red stuff- gone. Mud- gone. Blue stuff- gone. Bright and shiny carpet again. 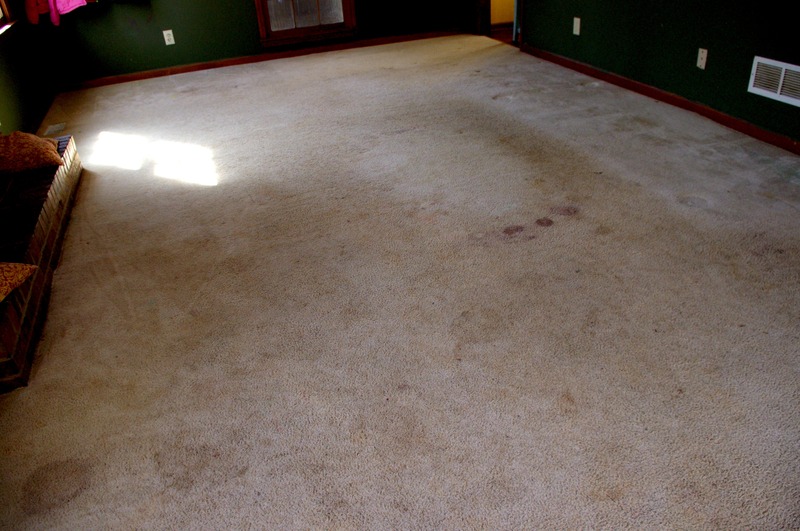 Let your carpet dry fully before you put your furniture back. 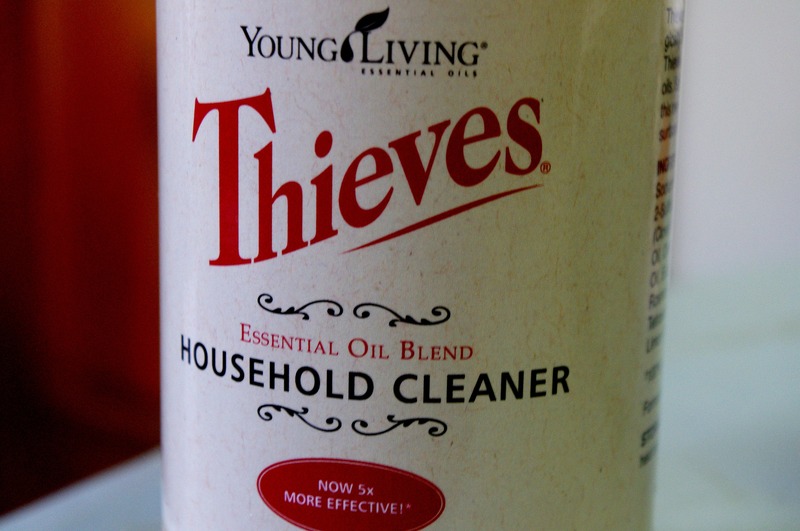 Now, more shout out about this Thieves Cleaner- I used it to then clean my brick fireplace, baseboards, windows, back door, outside windows, kitchen countertop, and coffee table. And I cleaned all that with one capful of cleaner. My bottle is still about 3/4 full! Now that is awesome.